I was half-watching “Kindergarten Cop” at my gym last week. Rest assured I was a captive audience as it was the only thing on the TV. One of the scenes is Arnold Schwarzenegger taking a plane – Alaska Airlines to be exact – just shown long enough to see and short enough not to think why this is still on the screen. This was 1990, but a blip in the radar of movies with commercial product. Flash-forward to 2011. With product placement and tie-ins around for decades and firmly woven int o the TV and film landscape, Morgan Spurlock of “Supersize Me” fame takes on this sticky issue in a satirical yet serious way in “The Greatest Movie Ever Sold”, a documentary within a documentary (or “docu-buster” as he calls it). The film chronicles his quest to get “The Greatest Movie Ever Sold” financed by brand sponsorships. Spurlock sews together an engaging, satirical look at how Hollywood and Madison Avenue not only share a bed, but openly exchange bodily fluids. It’s an entertaining documentary tucked inside a marketing lesson. As provocative and interesting as Spurlock’s film is, it might have advanced past marketing 101 to explore how brands, whether we like it or not, give a film part of its storytelling cred. While the presumption that there is something sleazy and inartistic about brands and film merging, Spurlock only scratches the surface of how potent this combination can be used with today’s sophisticated, over-materialized consumers. Don’t get me wrong, the film is a must-see to understand how movies and marketing morph together in the back office bankrolling of Hollywood. It cleverly cuts between Spurlock’s narration, interviews with cultural luminaries and film makers, sponsorship “sell” meetings with company execs, snippets of product placement in pop culture, and of course shameless plugs of sponsored brands such as POM, Hyatt, Sheetz, and, yes, Mane N Tail – the only shampoo for horses and humans (about which he constantly pokes fun). Spurlock reminds us of what we are all painfully aware of – the ubiquitity of branding in film and the increasingly blurry line with crass commercialism. The takeaway from the film: the all-mighty branding dollar reigns supreme in Hollywood movie making. And this is where we get back to brands and their impact in a film narrative. What Spurlock doesn’t discuss is how products and lifestyle brands provide an instant, rich telegraphing of place, time, and status in film. In other words, the branding adds flavor, spice, color, and real-life. Gone are the days of a can with “Beer” written on it in block letters. Filmmakers must include actual products to resonate with today’s viewer for an instant “got it”. The question remains of which product and why (insert dollar signs here). To connote a home without much money, there would much likelier be a Sharp 20″ TV with rabbit ears than a Samsung 80″ theater-style one. Likewise, James Bond would not be driving a Hyundai. Nor would Clark Kent wear an Armani suit. Thus, the brand becomes part of the story. The fact is, companies and consumers alike are hyper-aware of how brands create personality, tone and place, whether it be a film, book, or pop culture art. Likewise, the shoes we wear on our feet, the car we drive, the food we consume, and every other decision we make on how to spend our money on “stuff” – consciously or unconsciously – not only tell the world who we are but who we want the world to think we are. 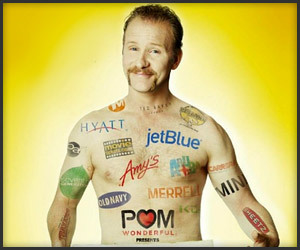 One of the most enlightening parts of “The Greatest Movie Ever Sold” is when Spurlock goes to an agency to get his “brand personality” analyzed for the appropriate sponsorships for the film – as if he were a product being primed for the grocery store, shopping mall, or online. We follow him through the process as he is grilled with hundreds of questions by branding experts to hone in on the essence of Spurlock. Turns out he is “playful” and “mindful” among other descriptors as his personal brand-therefore outlier-types such as Mini, POM, Target, and JetBlue are a good match. Not so much for Guess or Cadillac. Spurlock concludes in his film that branding, money and co-sponsorships in films are here to stay and will only get more entrenched as time goes on. That may be true, but using this fact to its full potential is what it’s all about. Blockbuster film-makers and indies have different priorities when making a film: For Big Hollywood it is all about the green. For indies it is about making good films first. But rest assured both will seriously evaluate what brand of TV to place in a working class family’s home and a millionaire’s mock French château. well-played my friend and well-written, I’ll never forget when I was at SanDisk how excited we got when the Hulk regurgitated a USB drive of “ours” – this makes me want to rent and watch this film – B.
hi Janice–ditto with what Barb says. I particularly get peeved with macs in TV shows. you always see an apple on the grey product in full view. just today i watched the good wife and there was a whole scene w/a grandma searching for the on button. honestly, that scene looked like a mini-commercial within the script. are there any tv shows or movies that have purposely rejected branding ads or use generic props? thanks for the tip about this movie–i’ll have to see it when it comes out in streaming on netflix—currently it is only in dvd. Rest assured that I will make sure and go and watch, strike that, rent this movie (from my library). Can’t wait until you comment on What Would Jesus Buy? Filmmakers must include actual products to resonate with today’s viewer for an instant “got it”. The question remains of which product and why (insert dollar signs here).